It’s already December! Merry Christmas and Happy New year to all of the Vandry BJJ Association students in Texas, Arizona and Afghanistan! This year has been such a roller coaster of events. We lost my top student and top Black Belt Gary Claxton earlier this year. Gary is always in our heart, and our community supported his wife. Rest in Peace Gary, you have helped so many of my students and our community. We will always miss you my dear, dear, student. We have had two new Vandry BJJ associations in McCallen and now South Austin area. We now have VBJJA associations in Austin, S. Austin, Buda, Lakeway, Killeen, Afghanistan, Arizona, Brownsville, Harlingen, and McCallen. What a growing community of Martial arts we all have together. And we are all vital components of this Association of Jiu-jitsu. We graduated new Black belts in our Association. BJJ Black belts Bryan Evans, Martha Velasco and Jesus Armas now join the elite group of BJJ Black belts Gary Claxon (rip), Carter Fisk, Manny Galvan, Jeremy Carbone, Matt Serfoss, Rob Furlano, Jay Hume, Ed Aiken, and Ted Osburn! Vandry’s 12! When I was a first-degree black belt, I dreamed of a future vision of the talented blue and purple belts that would late become leaders in our community and talented Black belts in their own right. We had a surge of women eager to train in self-defense at our seminars for women across Texas this year. Wow, what a turnout this year and we are looking to start a quarterly club for women training in self-defense. The VBJJA women’s self defense club had materialized and formed a bond of women that are new to Jiu-jitsu, self defense, and many have never done a martial art. They have shown how empowering women can be, and I note how talented women are physically due to their hip structure, and can actually develop Jiu-jitsu guard and techniques faster than physical males. When I see women in their 60’s that can train for two hours straight due to adrenaline, fascination, interest and a desire to develop these fascinating techniques of Jiu-jitsu, I think there is something there. I have worked with women specifically through women’s BJJ classes or women’s self defense clinics almost 10 years. I have had many women students before then, but many women need just an introductory understanding of Jiu-jitsu. I have worked with women in these areas, and taking my personal time to work on clinics and to further open the doors of Jiu-jitsu. My mentor Carlos Machado taught a seminar and we had a special weekend with him. I always enjoy his knowledge that he has passed to me, and to our community when he teaches our seminars. Master Carlos Machado receives Patriarch award by Professor Vandry to show his mentor respect, gratitude, appreciation and thanks for Machado’s chief role as a leader in BJJ. Justin McCready received student of the quarter award, and Manny Galvan received Black belt of the quarter award. I was proud to see my first female Black Belt in BJJ, Mrs. Martha Galvan, and my second female Brown belt, Ms. Theresa Guiterrez. Both are talented women, and have become leaders in our trade, and definitely are a workout for anyone! We had our awesome second annual VBJJA Halloween event, which is part of our community events outside of class. Our students train, compete, study and of course have events for them and their fellow warriors. Jen, Doc, Teresa and CJ at the Annual party! The REAL Captain Marvel and Ms. Marvel stop by Club VIP second Annual Halloween party! Strategies) was a law enforcement program I began in 2000. I taught APD police officers a clinic on hand to hand and regarding statistics on deaths of police officers. Working with law enforcement officials is an opportunity I enjoy, am grateful for, and must always keep up the current information for those that look out for our safety in society. In the martial arts, combat is sought. This is one dimension. It is not the only angle of learning. Learning about yourself, your abilities, your capabilities, your self confidence, your limitations, your ability to overcome, and later your abilities as senior students you are obligated to aid those that are less experienced, and help them to grow as well. I have been teaching for 15 years the art of Brazilian Jiu-jitsu. 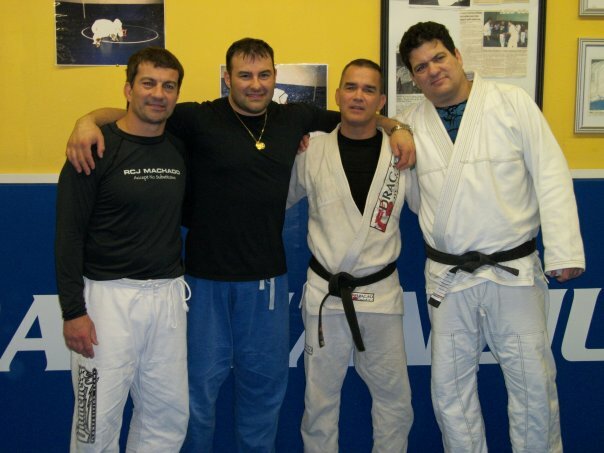 I have trained with the Machado brothers, and I have earned my rank as a third degree Black belt in the art of BJJ. I earned my belt the hard and most deserved way. I worked on it. I kept my research. Achieving a black belt is a beginning, and certainly not a level to claim an elite status of knowledge or class. I asked my black belts that were in attendance at our seminar to give a small speech on feedback on the community and seminar. I wanted to listen to my students who at one time started with me with a blank slate. Now they are mentors, seniors, and respected students and honorable black belts in BJJ. Each of my black belt’s have a name my chief instructor Master Carlos Machado knows personally. He knows each of them via seminars, sparring, talking, communicating, and developing a relationship with his second generation of lineage. They have that right due to their commitment, their duties, their loyalties, and their ethical work they have always maintained as my black belts to our community. I enjoyed listening to them speak. And I paid attention to all of our students across Texas that listened to them too. They absorbed each of their words. And those students one day will speak at one of my clinics to tell another generation about their perception of their lineage, and big brother and sister care and loving for their Jiu-jitsu siblings. I want to thank each and every one of our students across Texas, Arizona and Afghanistan for your loyalty, hard work, student mentality and your commitment to our community in the art of Brazilian Jiu-jitsu.